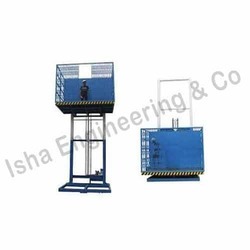 We are a leading Manufacturer of industrial goods lift, goods lift, goods lift with handrail, freight lift, hydraulic cage lift and cabin goods lift from Coimbatore, India. 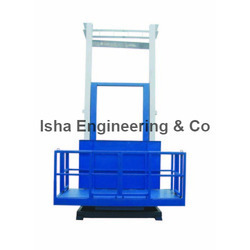 Hydraulic Goods Lift bulky items up and down stairs and ensures easy and trouble free shifting of cargoes and materials in godowns, warehouses and industries.Isha Surface Mounted Goods Lifts are designed and manufactured utilizing high quality well engineered components. Direct acting hydraulic actuated telescopic lift rams are utilized to provide a safe, smooth operating, auto-self leveling system. The free standing, self supporting modular design can be either surface mounted and accessed at low level. 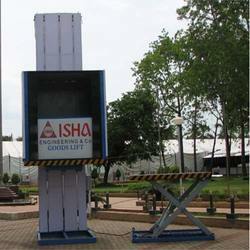 We have marked a distinct position in the market by offering superior quality Goods Lift with Safety Arrangement. The offered lift is manufactured using premium quality components and sophisticated technology in line with industry standards. Used for chemical industries, textiles, paper mills and pharma industries, our provided lift is available in variegated sizes and designs as per the requirements of the clients. Being client centric firm, we sternly tested this lift so as to ensure its quality. 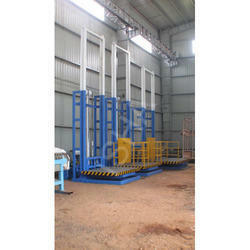 Supported by our hardworking professionals, we are also engaged in the providing of Goods Lift with Collapsible Gate. The offered lift is manufactured using the best quality components and progressive technology in adherence with industry norms. A team of quality examiners test this lift on varied parameters, before the final delivery. The offered lift is used in industrial and commercial places for lifting loads of any type. Pioneer in the industry, we are engaged in offering an impeccable range of Goods Lift with Handrail. Only premium quality component and advanced technology is used while manufacturing this lift in line with industry norms. 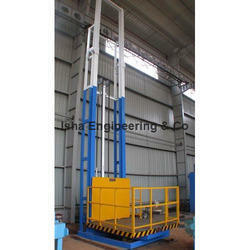 The offered lift is used in food industries, oil industries and vegetable oil industries. Apart from this, provided lift is offered in variegated designs and sizes as per the needs of our customers. To meet the diversified requirements of our prestigious clients, we are engaged in offering Freight Lift. 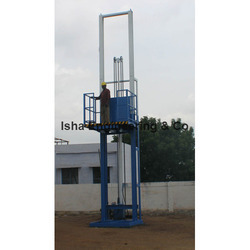 The provided lift is designed in line with industry norms using premium quality components and cutting edge technology under the vigilance of our proficient professionals. Ideal to provide a safe, smooth operating, auto-self levelling system, this lift is available in variegated sizes and specifications as per the requirements of clients. 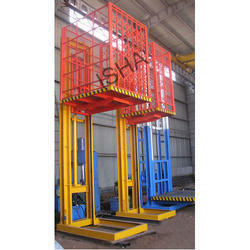 We are also engaged in providing Hydraulic Cage Lift. fully gated lift car, essential for roll cages etc. We offer a wide range of Cabin Goods Lift, that is manufactured with excessive precision and advanced scientific techniques. These Goods Lifts are used for lifting & lowering of gifts and can carry up to three tons of load at one go. Our range is available with variety of hoists, push buttons and switches. Our range is appreciated as it can be installed easily.